The residents of Virginia Beach, Norfolk, Chesapeake, and the surrounding areas represent a very diverse group of people, all with different definitions of “clean.” But the common thread throughout all these homes, from the “neat freak” to the chronic hoarder is that one place usually gets missed – the air ducts. Consequently, the quality of the air you and your family breathe could be effected. 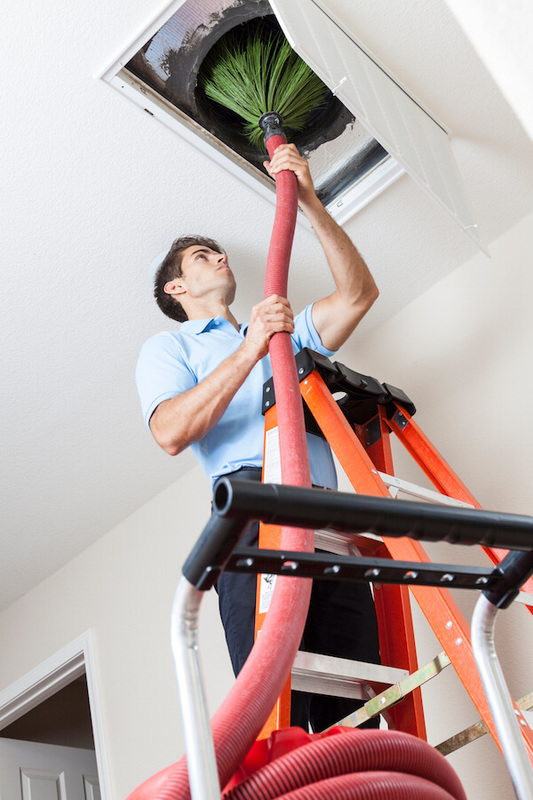 Air Duct Vent Cleaning services rarely cross our minds during the day. Why Air Duct Vent Cleaning? Air ducts may be out of sight, but they shouldn’t be out of mind when it comes to maintaining the cleanliness of your home. Over time, ducts can become caked with dust and dirt or clogged with debris. Allergens, such as cigarette smoke or pet dander can circulate through them. Which is causing potential problems for people with severe allergies, even after the source of the allergen is removed. Moist, warm air flowing through dark spaces provides an ideal place for airborne contaminants to grow. Even the smallest chink in your duct work can allow insects or rodents to enter and take up residence. This keep your air flow from becoming contaminated and spreading the contents of your duct throughout your home. This is why air duct vent cleaning is so important to you and your family. Duct vent cleaning is next to impossible for the average home owner to do because the majority of the surface area is hidden inside your walls and ceilings. Professional duct cleaners, however, have long snakes, large rotary brushes, and powerful suction systems. Which to go deep inside the nooks and crannies of these ducts, where nothing else can reach. These tools can dislodge and remove even years-old deposits of dust. Also dirt, debris, rodent and insect nests, feces, airborne contaminants, and more. Call us now for best and effective air duct vent cleaning. We are leading duct cleaning company in Hampton roads and surrounding cities. Even more importantly, the professionals at Universal Duct cleaning also have the advantage of HEPA vacuums. Which uses the same level of advanced filtration that hospitals and surgery rooms use to ensure the dust. Also unsanitary particles from your ducts are not spread into the air inside the room. We can also inspect your ducts to determine its material composition, since different substances require different treatment. Fiberglass board, for instance, requires soft brushes, while metal requires less care. If your home is old and has asbestos-containing substances that would put you and your family at risk. We can determine that as well and halt the cleaning process before it starts. In these instances, such cleaning could release cancer-causing substances into your home and the duct work should be replaced by a certified professional. Finally, it’s important to note that duct cleaning does not include just ducts – for the job to be done properly, the entire HVAC system should be cleaned. Which includes the blower motor, fans, grills, coils, drain pans, registers, filters, heat exchanger, and more. At Universal Star Duct Cleaning™ we do things the right way – cleaning every nook and cranny of your entire HVAC system. Call us today for effective HVAC system cleaning. Who Should Get Their Ducts Cleaned? A recent vermin infestation (insects or rodents who may have taken up residence in your duct work). We specialize in Insulation Removal. Sanitation involves applying an antimicrobial chemical to kill bacteria, airborne contaminants, and to minimize the chance of re contamination. However, unlike spraying your kitchen counter or cleaning your bathroom sink, duct sanitation must be done with care. It is only when necessary to kill excessive microbial growth. Only a reputable and experienced duct sanitation company should attempt this. At Universal Duct Cleaning, our technicians take the full care to sanitize only in safe and effective ways. We will recommend sanitation only when mechanical cleaning is insufficient to prevent bacteria or airborne contaminants from becoming a health hazard. Advise the homeowner about any protective actions they need to take. Call Universal Star Duct Cleaning™ For The Best Service In The Hampton Roads Metro Area For Duct Vent Cleaning. Universal Duct Vent Cleaning puts your family’s heath and safety first. Our highly-trained staff and specialized equipment designed to maximize both our efficiency and your heath and safety. Which make us one of the best duct cleaning services in the Hampton Roads area. Call us today to schedule an estimate at (757) 962-0419 . If you are looking for air duct cleaning companies in your area, give us a call. We will serve you with our affordable and effective duct vent cleaning services.